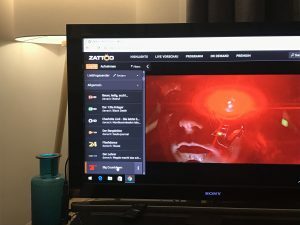 most new tv’s are coming with apps included for viewing youtube, netflix etc – but if you have an older tv without this feature what can you do? at home I have an older Sony LCD. so I just got hold of a windows PC on a HDMI stick. add a small bluetooth keyboard and you have a working PC on your TV. you can view whatever you can watch in a web-browser. perfect for netflix, amazon prime, zattoo or any other media service you may want to you.